I have to admit something up front. As excited and supportive as I was about the Iowa Quilt Museum project from its inception, and as much as I love that beautiful old JC Penney building that I remember shopping in as a kid, with all its vintage architectural details, I had a hard time visualizing an effective museum being located in that dark, boxy space — until yesterday. Yesterday I stepped inside that familiar building and was completely blown away by the creative vision of the IQM board, the architect (Mark Thiessen, who also did the John Wayne Museum), the contractor, and the many volunteers who each brought their own areas of expertise to what is now an eye-popping, state-of-the-art museum with a flexible layout. Bravo! Trust me, these photos don’t even do it justice. You need to go see the Iowa Quilt Museum for yourself at 68 E. Court, on the south side of the Winterset square between Ben Franklin and Village Bootery. It is stunning. Honestly, it is easy to see why. 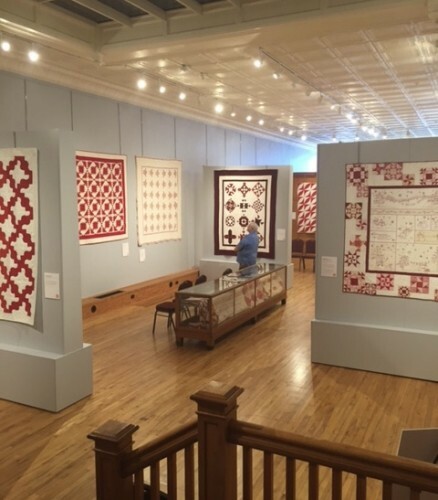 A lot of work went into the restoration and creation of the Iowa Quilt Museum, but Fons described it as a very smooth process done by experts, many of whom are local. Contractor Dan Bush of Newcastle Home Builders finished his work ahead of schedule, allowing for plenty of time to set up for the soft opening on May 21. Kyle Kuhns refinished the floors before loading, and Mark Ellwanger of Madison County Cabinetry engineered and built the ingenious movable walls that will allow various configurations for future exhibits. These movable walls allow the lower part of the museum to showcase double the amount of quilts vs. what could have been hung on the perimeter walls only. 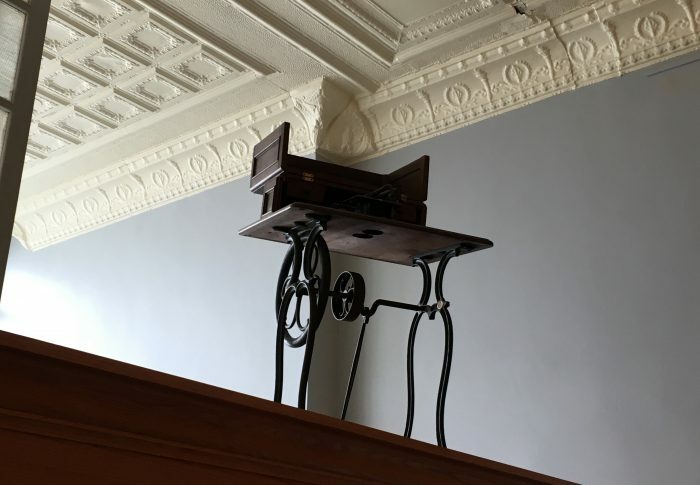 Two old treadle sewing machines are on loan from Tony Jacobson and the Madison County Historical Museum. Old display cases throughout the building are native to Winterset. Some were donated from the John Wayne Museum, and had originally come from stores on the square. This one, likely built in the late 1800s, had been in the basement of the building for decades. Other renovation work included the installation of a special HVAC unit and new concrete poured in the previously dirt-floored basement that will control humidity in the building, essential for the storage of historic quilts; a special hanging system that Marianne Fons learned about from friends at the National Quilt Museum in Paducah and the National Quilt Study Center in Lincoln; and the installation of LED ceiling lights in such a way that no shadows are cast by people standing in front of quilts. Much of the ornate woodwork was actually completed several years ago by Jeff Farr and Greg Hendricks, as part of a building remodel for John and Cora McQuigg’s gift shop, Islandcarragh Rose. 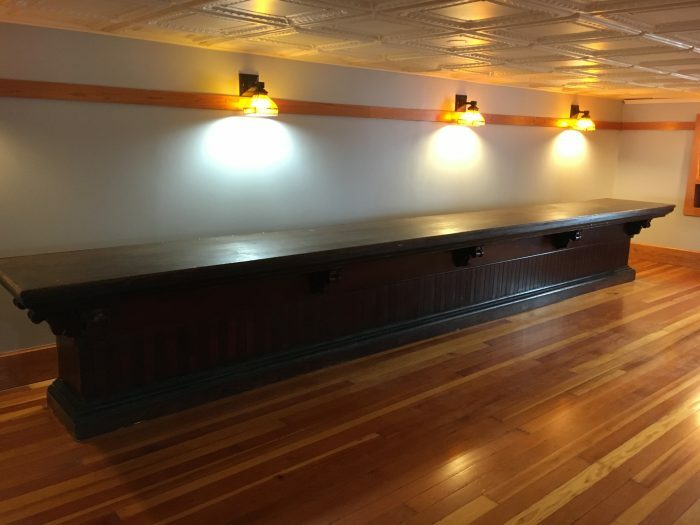 “It was the gift shop owners who exposed the original ceiling and original floor, and put in all this wood. They did everything so beautifully, including lighted display cases. We couldn’t have afforded to do that, but it was already here,” said Fons. Barrett is currently the Elementary General Music teacher at Winterset, and will begin regular duties at the museum once the school year has ended. 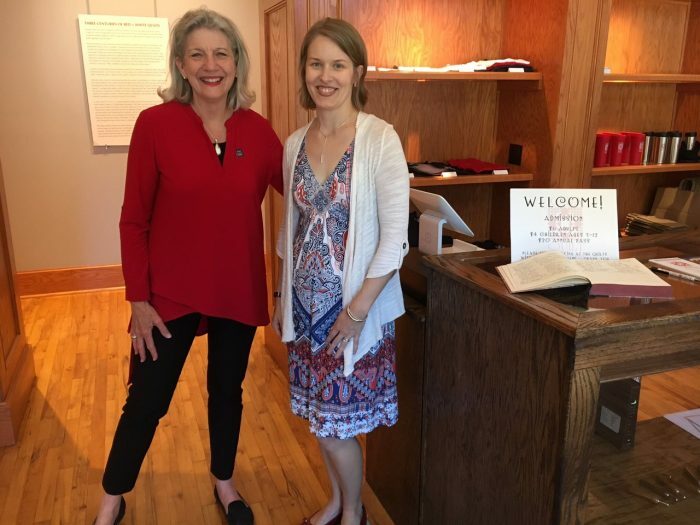 She will work with guest curators in planning and installing the museum’s changing exhibits, and will also coordinate volunteers and supervise the gift shop. Before taking the elementary music position, she was Winterset High School Choir Director from 2006 to 2012. She is currently the Education Coordinator at First United Methodist Church and has served on the board of directors of The Winterset Stage since 2011, currently as its president. 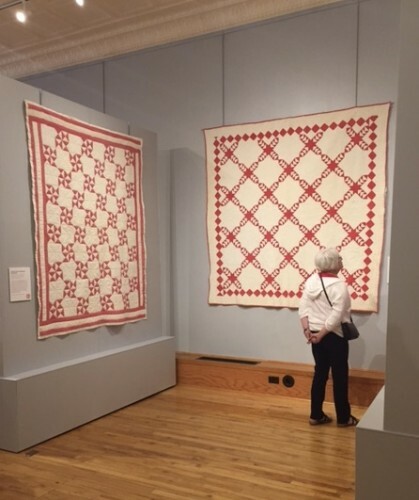 The museum’s inaugural exhibit is “Three Centuries of Red + White Quilts.” I missed my chance to get a photo of Virginia Berger, the guest-curator of this first exhibit, but she has been essential in using her vast resources and knowledge to accumulate quilts for the first display. Berger lives in Adel, and she knows Marianne Fons through the American Quilt Study group, which is a national quilt historian’s association. She heard about the museum early-on and asked if she could help. Marianne knew that Berger would be a great asset for sourcing quilts for display. 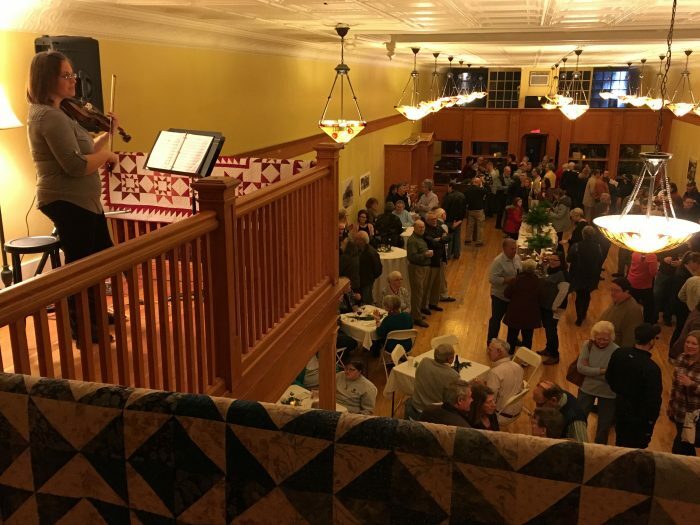 “Virginia is a collector and historian herself, and she is very connected with other collectors and dealers,” said Fons. Berger will also be the guest-curator for the next exhibit of star quilts, and there will be other guest curators as time goes by. 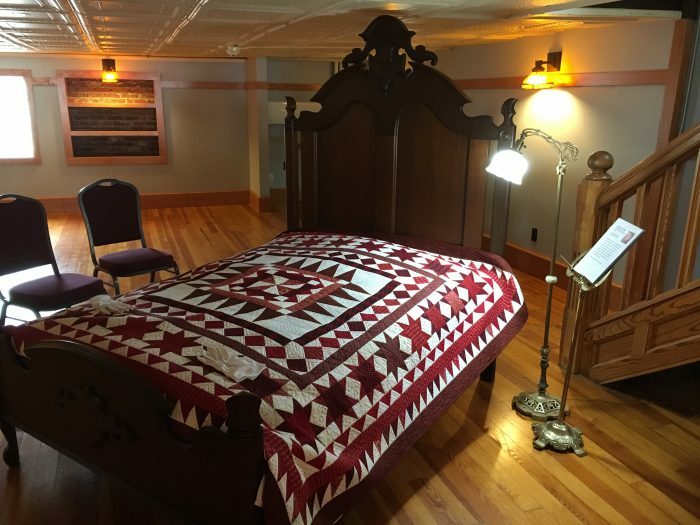 The antique bed on loan from the Madison County Historical Society is stacked with six quilts, so that visitors can put on the white gloves and turn them back one-by-one to view. The top one was made by Marianne Fons. Berger said, “One of the reasons we chose red and whites for this first exhibit is because we were on a short time frame, and it was an easy request to put out to people we knew. We’ve got quilts on loan from the Vesterheim Museum, Warren County Historical Museum, and the Madison County Historical Museum.” The collection also includes pieces from a number of local and nationally-known individuals, some of whom are quite famous in the quilt world, such as Heather Jones and Victoria Findlay Wolfe. 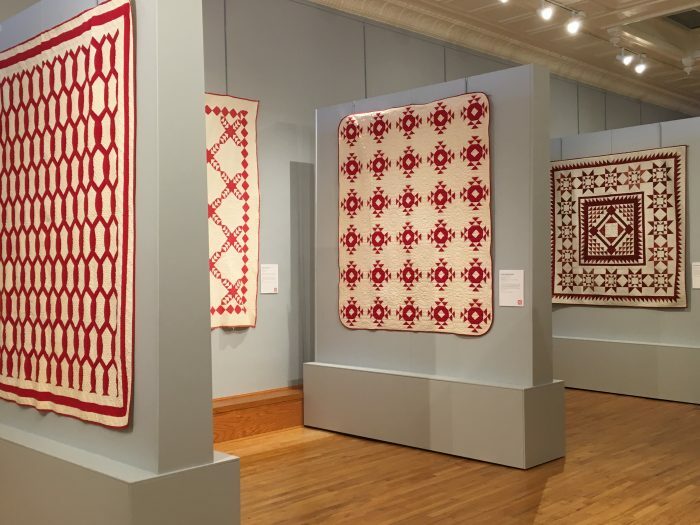 Fons describes them as “two of the rock stars of the modern quilt movement.” Red and white quilts are a historic genre, and a lot of them are seen in historic quilt books. Berger stated that red dyes were more colorfast than some of the others, and that’s part of the reason for their early prevalence. The oldest quilt in this exhibit is from 1849. 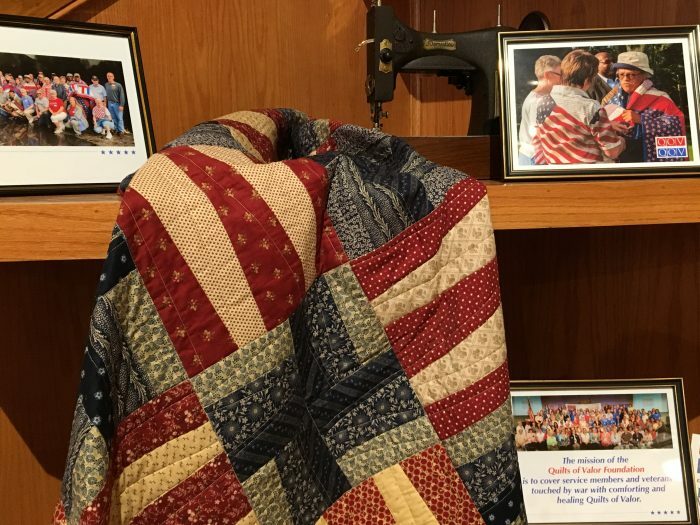 The Iowa Quilt Museum also highlights the work of the Quilts of Valor Foundation, with many of its volunteers, board members and donors directly involved in this great cause. 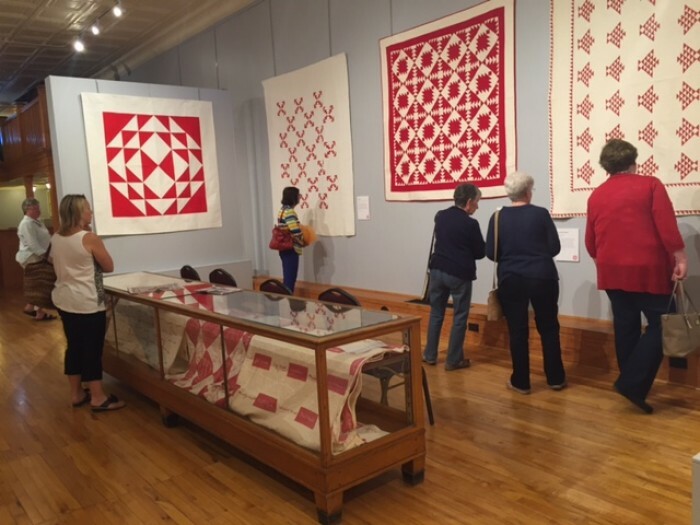 Tours at the Iowa Quilt Museum are self guided, but curator Virginia Berger could be contacted to lead group events. Admission is just $6.00 for an exhibit you won’t soon forget, and you’ll want to keep going back to see what’s next. 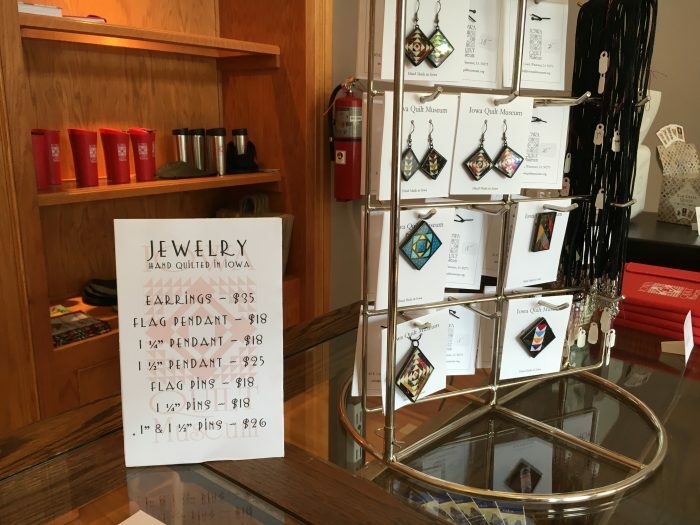 If you have interest in volunteering at the Iowa Quilt Museum, they could use your help! You don’t need knowledge of quilts or quilting to help, just a willingness to greet visitors as they come. Contact Megan Barrett at director@iowaquiltmuseum.org if you are interested. When your out-of-town guests come this weekend for the John Wayne Birthday Celebration, be sure to take them to the Iowa Quilt Museum. They also hope to see you at the Grand Opening on June 4th. Kudos to IQM Board Members Pat Corkrean, Linda Duff, Marianne Fons, Tony Jacobson, Phyllis Kaldenberg, Becky Kile, Terri Kuhns, Jodi Lake, Jerry Parkin, and Amy Sawyers for your vision and action. What a great thing you’ve done for our community!